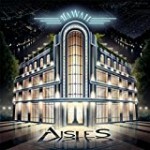 Share the post "Album review: AISLES – Hawaii"
Ahh, Aisles, geniuses or not – it’s a very fine line between between the two isn’t it, and this had me thinking all the way through. I reviewed the Chilean (yes, Chilean) progressive rock outfit’s last two albums ‘In Sudden Walks’ (2012) and ‘4:45AM’ (2013) – both of which were excellent and, in the latter’s case, a great leap forward both in songwriting and musicianship. I was therefore looking forward with relish to ‘Hawaii’, a sprawling double concept album about a colony in space created by the people of the Earth shortly before the planet died. I use the word ‘sprawling’ advisedly as I cannot help but think that the band have over-exerted themselves here in an attempt to fully realise their prog credentials. Yes, it’s a double album and yes, the artwork is excellent but memories of Yes’s overblown trilogy ‘Tales From Topographic Oceans’ were never far away – and this is what makes ‘Hawaii’ a missed opportunity. With judicious editing and perhaps an external producer (to ask the odd question) the album could easily have been reduced to a single disc – and with the excesses curtailed, the over-repetitive breakdowns and the King Crimson-like discordant nonsense eliminated we could have been looking at a very special album indeed. For, despite its occasional failings, this is a work of supreme songwriting and musicianship of the highest calibre. Disc One starts very promisingly with the sublime opening ten minutes of ‘The Poet – Part One’ with its almost jazzy intro and classic prog segues running into the more downbeat acoustic of ‘The Poet – Part Two’ which uses themes from the first track. ‘Year Zero’ with the chorus pedal in full effect carries things along nicely to ‘Upside Down’ with its lovely piano figure opening sounding, to these ears anyway, very Yes-like and with some tasty Hackett-esque guitar thrown in – although spoiled a little by an over-repetitive riff. The final cut on disc one, ‘CH-7’, is a classic case of where a slash of the editor’s knife wouldn’t have gone amiss – the whole track being dominated by spacey guitar noises, a spoken vocal and the band appearing to be locked into a riff they can’t get out of. Twelve minutes here that could easily be six without missing anything. This could equally be true of Disc Two’s slow-paced opener ‘Terra’ with its lovely acoustic opening which is somewhat spoiled by an over-repetitive fade out which then descends into a KC noise-athon. Things look up significantly with the celestial ‘Pale Blue Dot’ – the outstanding track – and the title cut ‘Club Hawaii’ which uses spoken word with the music to give the denoument of the concept. There can be no doubt that much of ‘Hawaii’ is touched by genius, some of the musical passages are genuinely jaw-dropping and the concept stands up well to scrutiny – but the overall feeling is one of a band trying too hard to fill a double album where a little curbing of excess would have produced an exceptional piece of work. Alan sequences “The Eclectic Mix” on Get Ready to ROCK! Radio, second Sunday of the month at 18:00 GMT. Expect some prog and, maybe, some Aisles. This entry was posted in ALBUM REVIEWS, ALBUM REVIEWS (Mobile), All Posts and tagged Aisles, album, Chile, Hawaii, prog, Progressive Rock, review. Bookmark the permalink.